Another one of the important crops from the Northern Provinces of Thailand is Lychee. This fruit originated from Southern China more than a thousand years ago. It is believed that the Chinese Merchants brought this fruit to Siam in early Rattanagosin Period, app. 200 years ago. In earlier day, lychee is concentrated around Bangkok neighboring fruit orchards. It is still cultivated in Samutsongkram province and become one of their specialties. The season for lychee is between Late March to June. During season, When you are driving to Huahin, just after you have left Bangkok area, you will see fruit-stalls selling lychee along the road all the way until Ratchaburi Area. There are 5 different type of Lychee cultivated in Thailand. Among the famous ones is so called Emperors Lychee (shown in the picture) – called so probably because of their size. 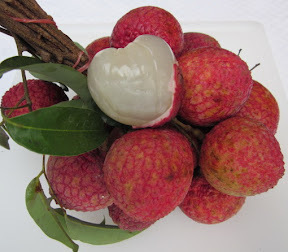 Lychee is a nice fruit, taste sweet and a little sour at the after taste, but very aromatic! They are a bit delicate and get spoiled easily. They have thin pink skin, white watery sweet and aromatic meat. If you are lucky to get the one with smaller seed, then you can relish their meat a bit more.